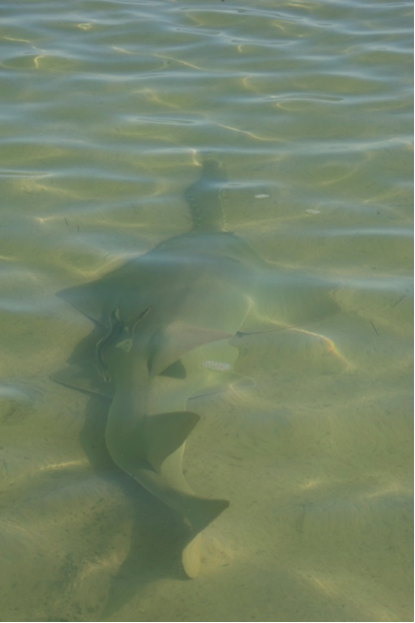 Sawfish research in the Bahamas: GPS tracking endangered smalltooth species. Tripp Rackley, Brady Rackley, and John Carlson attach a GPS tag to a smalltooth sawfish. The sawfishes, best known for the distinctive tooth-covered rostrum that gives them their name, are a family of rays. The saw is used to stun and kill prey, and it is so sharp that pups are born with a thick membrane over their saws to protect the mother during birth. Sawfishes are some of the most threatened species of fish in the world. Smalltooth sawfish (Pristis pectinata) were once commonly seen from North Carolina to Texas and throughout the Caribbean, but today the Everglades and the western side of Andros Island in the Bahamas are some of the only remaining places where they can reliably be found. A team of scientists has just returned from an annual research expedition to study the smalltooth sawfish at Andros Island. Even there, finding sawfish is incredibly rare. This year, the team found five smalltooth sawfish, the highest number encountered in four years of studying the Andros population. One of the goals of this research project, funded by the Moore Charitable Foundation, is to determine whether there is movement between the sawfish populations, in particular between Andros and south Florida, information that has important implications for their management. One of the smalltooth sawfish was fitted with a GPS satellite tag that will allow scientists to track its movements and help identify critical habitat. “We hope to determine if there is significant movement and genetic exchange between the U.S. and Bahamas,” says Dean Grubbs of the Florida State University Coastal Marine Lab. The GPS-tagged sawfish—named Blair; others were named Tammy, and Elizabeth, all after high school teachers who have participated in NOAA’s Teacher at Sea program—will contribute to the body of knowledge on how sawfish use habitat. A smalltooth sawfish at Andros Island. Sawfish are in big trouble. “All known populations of sawfishes have severely declined based on museum records, scientific surveys, anecdotal fisherman observations, and limited catch per unit effort information,” says John Carlson of NOAA, one of the expedition leaders. All known species of sawfish are listed as Endangered or Critically Endangered on the IUCN Red List, and both smalltooth and largetooth sawfish are protected by the United States Endangered Species Act. Sawfish face many threats. Historically, people fished them heavily for their meat, especially in Lake Nicaragua. Today, they are frequently victims of unintentional fisheries capture. Their tooth-covered rostrum makes them extremely susceptible to getting tangled in fishing gear, which often results in their death. Another major threat facing sawfish is habitat destruction. Juvenile sawfish rely on shallow, mangrove-lined estuaries as nursery habitat, and previous satellite tagging studies on this species have shown that adults spent 96 percent of the time in shallow coastal waters. Unfortunately, much of this habitat has been rendered unsuitable for sawfish due to new construction of waterfront property. Sawfish need mangroves and waterfront habitat more than condominiums do. Though the situation is dire, a recent paper by this research team shows that there is hope for the species. While extinction is likely if fishing mortality remains high, models show that population recovery could occur in as little as 40 years if fishing mortality is greatly reduced. New protections may be needed. The sawfish research team made another important discovery. Before this expedition, southwest Florida held the only known locations of nursery areas for young smalltooth sawfish. However, “Andros has nearly as much mangrove habitat as all of the Everglades in Florida. Therefore, if nurseries exist in the Bahamas, they should be in Andros,” Grubbs said. After this expedition, Carlson told me, “we now have gained evidence of younger [less that 1 year old] sawfish in the upper portion of the numerous smaller creeks and bays in Andros. These areas may represent potential nurseries for smalltooth sawfish on Andros Island.” The data gathered by this project will be invaluable in promoting the recovery of the smalltooth sawfish, one of the most endangered marine fishes on Earth.